Massachusetts 54th Regiment reenactors posed in front of the Robert Gould Shaw and the Massachusetts 54th Regiment Memorial after an event marking a signing of a Memorandum of Understanding to jointly restore the memorial. 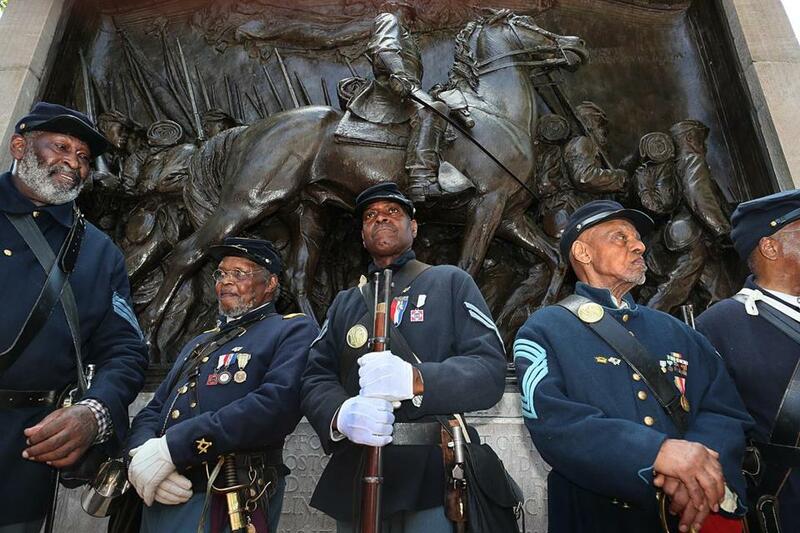 A longstanding tribute to a pioneering group of African-American soldiers who fought in the Civil War, the Robert Gould Shaw and the Massachusetts 54th Regiment Memorial is getting a multimillion-dollar restoration. Mayor Martin J. Walsh signed a memorandum of understanding Friday that will set aside $2.8 million to renovate the memorial, which is on Boston Common across from the Massachusetts State House. Representatives from the National Park Service, Friends of the Public Garden, and the Museum of African American History also signed. Officials said they planned to use the renovation as a chance to spark discussions about race and social justice. The memorial has stood on the Common since 1897, according to the National Park Service’s website. The striking sculpture, created by Augustus Saint-Gauden, depicts Colonel Shaw and the 54th Massachusetts Regiment marching down Beacon Street as they departed for the war. She said a “community conversation” is planned in October or November that will bring in national figures to talk about the power of monuments in public discourse. Marita Rivero, executive director of the Museum of African American History, said the museum would use the memorial in its Race in the Public Dialogue series. “Its placement across from the State House is an expression of human rights and equality,” Rivero said. Walsh said other memorials marking African-American history are in the works around the city. Memorials of Martin Luther King and Coretta Scott King are being planned, and the city is thinking about commissioning a memorial at Faneuil Hall to the victims of the slave trade, Walsh said. Vizza said renovations would begin in the spring and were expected to take five to six months. During the project, the section of the Common surrounding the memorial will be fenced off, Vizza said. The repairs will focus on waterproofing the monument’s foundation and preserving the bronze of the sculpture. Friday’s ceremony saw the 54th Massachusetts Volunteer Regiment of reenactors serve as an honor guard, with the 215th Army Band of the Massachusetts Army National Guard playing traditional military songs. The 54th Massachusetts Regiment was the first official African-American regiment in the Union Army during the Civil War. Noted abolitionist Frederick Douglass lobbied President Abraham Lincoln to allow African-Americans to serve, and two of Douglass’ sons joined the 54th. The 54th Massachusetts saw action at Fort Wagner in South Carolina in July 1863. Around 600 soldiers assaulted the fort. The regiment suffered 285 casualties, including Shaw, who was killed, the park service said. “They fought with bravery and distinction and they fought for the highest purpose of the war: to make people free,” Walsh said in his remarks.